These awards are given as recognition of completion of the Sea Badge Course, which is the advanced training course for Sea Scouting leaders at the Ship, District, Council or Regional level. The single trident versions are awarded to attendees. (The different background colors are for different color uniforms.) The version with two tridents is awarded to staff members, and the three trident version is awarded to course directors. 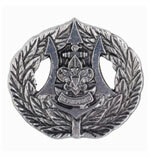 There is also a Sea badge pin, pictured, below, which is awarded after completion of the course. Attendance at the Sea Badge course is nominative. Credits: Original and blue on silver knot scans courtesy of Mike Walton.